Our Staff love playing and learning too!! 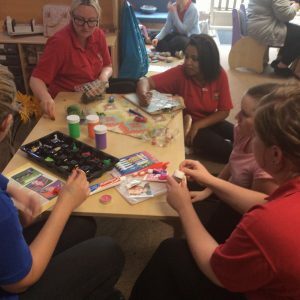 The nursery staff are continually updating their knowledge and understanding by attending a variety of training sessions, and when this includes the opportunity of ‘hands on’ activities, they are in their element! Following attendance at DEEL (Developing and Enhancing Early Language) Training, Dale delivered a fun, informative and engaging session for staff in the evening after work. We explored the differing types and effectiveness of activities and resources that we provide for children to help develop their communication skills including listening, understanding and speaking. Staff discussed a wide variety of different ideas and it was very useful for staff from different rooms to share their ideas with one another. 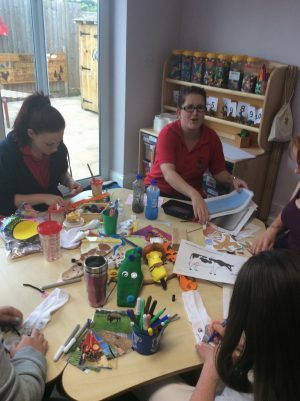 Dale asked the staff to split into groups containing staff from different rooms to promote team building, to develop some resources from items that are readily available within the nursery to use with different ages of children. They were given different themes to explore. My favourite was ‘The Gingerbread Man’ The staff made sock puppets of the different characters, sensory bottles to represent the sand and the river, and talked about making recipe cards to use with the children as well as gingerbread scented playdough to develop the play further. Thank you to all our staff for attending, and also Dale for leading the session.